Since 1980, Michigan’s underwater preserve system has grown to occupy more than 7,000 square miles of Great Lakes bottomland in thirteen distinct underwater preserves. They protect some of the region’s most sensitive and historic underwater resources. Thanks to the strict legal regulations forbidding the removal of artifacts and the conscientious adherence by divers to the law, shipwreck diving in Michigan’s Great Lakes is some of the best in the world. Divers unfamiliar with Michigan’s underwater preserve system are surprised to find well-preserved, pristine shipwrecks. Even small items such as cups, silverware, tools, machinery ornaments and other relics remain where they were discovered by the first divers many years before. Narrow points between land masses create natural “choke points” for navigators. 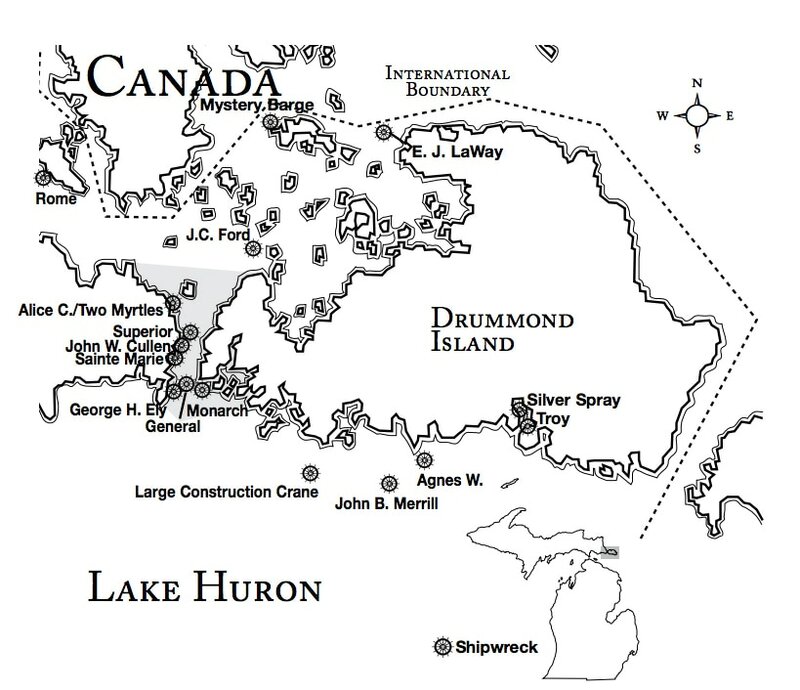 The DeTour Passage is just such a natural point channeling ships bound from Lake Huron to the locks at Sault Ste. Marie into a narrow strait between the eastern tip of Michigan’s Upper Peninsula and Drummond Island. Storms, heavy seas and navigation errors have all contributed to shipping losses in and near the Passage. The remains of lost ships rest there in fairly shallow waters easily accessible to divers. ​Shore accessible dive sites include the hulls of abandoned wooden ships. A portion of one of these, the Sainte Marie, can be seen above the water. The steel paddlewheel of another shipwreck can be found nearby. Divers should be aware of private property rights when accessing shore locations. Permission of property owners should be obtained when appropriate before crossing or accessing private property. ​In addition to the shipwrecks, the continuing importance of this area to maritime shipping can be seen in the passing of modern freighters traveling through the area. Visitors can spend an enjoyable time watching the freighter traffic. Below is a list of shipwrecks in the DeTour Passage Underwater Preserve.​For a description of the shipwreck, click on the name below. ​Divers should be prepared to locate the various shipwrecks themselves for diving. GPS coordinates for each location are available at the links above. Be ready for cool water temperatures. Although surface water temperatures may reach 65 degrees or more in midsummer, temperatures below 40 degrees are common at depth. Most Great Lakes divers use full wetsuits or drysuits. Divers and boat captains should take care to avoid anchoring into the wrecks and doing unnecessary damage until moorings are provided. Be prepared. The Great Lakes are as unpredictable as they are beautiful. Storms and heavy seas can arise suddenly with little warning. Do not head out onto the Great Lakes unless you have proper safety equipment, an appropriate vessel and experience. Never leave your dive boat unattended. If trouble arises, the U. S. Coast Guard monitors VHF channel 16 and search and rescue service is available. A Diver's Guide to Michigan Underwater Preserves is a great resource for discovering all of Michigan's sunken treasures.